This and the next book were written for the students rather than as a teacher resource book but I think you will find some useful ideas in here – provided you can still find a copy. 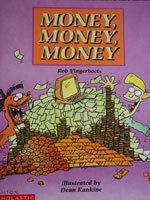 Scholastic published Money, Money, Money and Out In Space as part of a series of books called Mathshelf. I think the company finally relented and allowed teachers to buy individual books rather than the whole series of 10 books. This book gets kids into the history and then the practicalities of money/currency.